It is not only possible to survive Christmas with your sobriety intact; you can also have a wonderful time while you are at it. This is a special time of year for many, and there is no reason why you should have to miss out on the fun. Millions of people around the world enjoy Christmas without the requirement of intoxication, so there is no reason why you cannot do the same. There are many sobriety tools that are useful at this time of year, so we have listed 12 of the best of them right here. Getting sober is no small achievement, so you deserve a bit of reward. Do not look at this as an indulgence because it is actually a smart thing to do. This reward for your hard work is going to give your motivation a boost, which is something you may need this over the holiday period. You have likely saved a good bit of money by not drinking or using drugs, so why not use some of this to spoil yourself? This is an especially good idea if it is your first sober Christmas. One thing that happens when caught up in addiction is associating everything with getting drunk or high. This means that Christmas carols may remind you of getting drunk, and even the Christmas decorations can trigger memories of intoxication. You are also likely to have developed traditions while caught up in addiction that you now associate with this time of year – for example, drinking lots of wine while you prepare the turkey. These associations between Christmas and substance abuse are just mental habits, so you can now begin to develop your own sober mental associations. You can start to link Christmas songs with memories of this year, and you can create new traditions such as going for walk before your big dinner. People have a tendency to spend more time indoors over the holiday period. This can be a problem because it can make you feel stressed and a bit groggy. People need to spend a bit of time in nature regularly in order to thrive. It is therefore recommended that you make some time to go for a daily walk in the local park or to spend some time in the garden – if it is a white Christmas, you can help the kids make some snowmen. Fellowship meetings can be a real godsend at this time of year because it means you will be around people who understand the challenges of staying sober during the festivities. There also tends to be a wonderful atmosphere at the meetings in the weeks running up to Christmas, so this should help to get you in a festive mood. If you are newly sober, it might be a good idea to commit to one meeting a day over the holiday period. It is also strongly recommended that you keep a list of meetings handy in case you start to feel a bit wobbly and need some emergency support. Even when you are not drinking alcohol, there is still an expectation that you have some type of drink in your hand. Plain water can be too boring, but if you drink sweet things such as coke, you could end up feeling sick. A good option as a non-alcoholic drink you can sip all-night is soda water. This is a bit more exciting than tap water, but it is unlikely to make you feel sick no matter how much you drink. The other nice thing about it is that there are zero calories to worry about. Even people who do not drink alcohol still tend to overindulge in food over the Christmas period. It may be a bit unfair to expect you not to do this as you already have enough on your plate (pardon the pun), but it is recommended that you protect yourself from this overindulgence. One way of doing this would be to have a personal wellness break in the run-up to Christmas. This could be a week in which you stick to a healthy diet and get plenty of exercise. It is also a good idea to engage in plenty of stress-relieving practices such as meditation so you are better prepared for any challenges ahead. 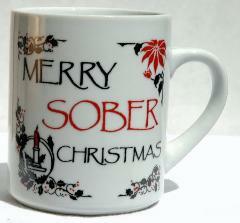 A strong sober network will give you a huge advantage over the Christmas season. It means you will always have people to turn to for support and advice should things become challenging. You can start collecting emails and telephone numbers at recovery meetings – even if you do not end up using them, it is good that you have them, just in case. Spending time with sober friends will also allow you to enjoy Christmas more because these people will be on the same wavelength as you. Doing some voluntary work over the Christmas period is a wonderful thing to do, and it will strengthen your sobriety as well. This is a time of year that many people struggle, so any help you offer can make a huge difference. There are lots of organisations looking for volunteers, but you can also do some service if you are a member of a fellowship such as AA. If you must go to a party where alcohol is going to be served, it is recommended that you bring along some non-alcoholic drinks. The reality is that the focus at many of these events is the alcohol, and soft drinks are often only provided in a limited supply as mixers. The other benefit of bringing along your own bottle is that it reinforces the fact to everyone else that you do not drink alcohol. It is unfortunate, but there are some idiots out there who think it is funny to spike the drinks of those who are in recovery. The individuals who engage in this type of activity are often dealing with substance abuse problems themselves and view your sobriety as a threat. This type of sabotage is particularly dangerous if you are using a drug such as antabuse – even a few sips of alcohol could make you very sick. The way to avoid spiked drinks is to never let your glass leave your hand. If you go to the toilet, you need to buy a fresh drink rather than returning to the one that you left on the table. It is understandable that you will be distracted by conversation but try not to take your eye off your drink for too long. If you are ever suspicious – just leave the drink and get a fresh one. If you really want to let your hair down this Christmas, you definitely want to try one of the Christmas sober parties. The biggest of these are organised by AA and it can be an amazing experience to dance the night away with people who are all completely sober. You are likely to leave this event on a huge natural high, which can strengthen your sobriety. The fact that you may have to spend a lot more time with family over the holiday period can be a huge challenge. The problem with families is they know each other two well, and they know which buttons to press to get a reaction. It is important to get breaks from this type of atmosphere. This is another reason why going to extra meetings over the Christmas period can be such a great idea.